On Friday, November 30, students and parents alike gathered into the auditorium for the annual Fall Arts Showcase. The event is held every year towards the end of the first semester to show off the talents of the art, band, chorus and drama classes, and also serves as an opportunity for underclassmen to explore possible classes to take in the future. 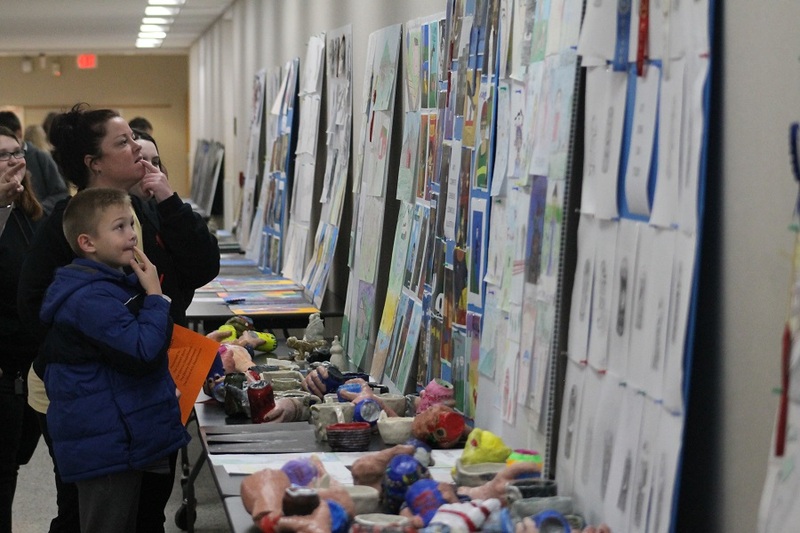 The event opened with a showcase of projects created by the Art class, which included two and three-dimensional art pieces that were judged for first, second and third place. The contest winners in Art I were Abby Tabares, Brandon Harris, Morgan Hairston, Ethan Lewis, and Emma Hewett for 1st place in all categories. Second place winners were Isabel Beckmann, Madelyn Ross, Sadie Asbury and Kayla Cousins. Third place went to Taylor Galyean, Alyssa Scarce, Abby Taberes, Lexie Wilmoth, Kenneth Osborne, and Angel Gibson. Best in show was awarded to Brandon Harris. In Art II, 1st place winners in all categories were Shawn Holcomb, Dulce Corona, and Caroline Heffinger. 2nd place winners were Brandi Shaffer, Caroline Heffinger, Aleise Thornton. 3rd place winners were Holland Dalton, Brandi Shaffer and Savannah Mayberry. Best in Show went to Shawn Holcomb. In Art III and IV, 1st place winners were Wesley Honeycutt, CeCe Phillips, Nikki Scarce and Shaleigh Raymond. 2nd place went to Shaleigh Raymond, Jessica Ramirez, Frankie Hash and Aiden Bork. 3rd place went to: Dixie Dunn Jessica Rameriz, Dixie Dunn and Nikki Scarce. Best in show went to Shaleigh Raymond. After a while, the auditorium doors were officially open and the event went into full swing with the Trojan Vanguard Marching Band’s award winning show, “The Pyramids of Egypt.” Unlike previous shows, the band was able to perform on the auditorium stage and not in the gym. Although the otherwise mobile show was performed while standing still, the show was still positively received by the audience. After the band had performed, the chorus club took the stage and performed an arrangement of Christmas carols. The songs performed were White Winter Hymnal Alan Billingsley; Riu, Riu, Chiu by Linda Spevacek; Christmas Time Is Here by Steve Zegree; A Holly Jolly Christmas by Greg Gilpin; and Christmas…In About Three Minutes by Mark Weston. The Drama one act play cast closed out the night with their play, “This Side of Heaven”, which won regionals and was nominated to advance to state level competition. The audience enjoyed the performance, laughing the whole way through and giving a standing ovation at the end. The cast left on Sunday, December 2nd and performed in competition the next day, Monday, December 3rd. The cast won the state competition with senior actors Mary-Catherine Jones and Camron Beale were awarded with Outstanding Actor awards. Overall, the night was a spectacular display of talent and passion from Tunstall’s artistic classes. Though it was bittersweet for the senior performers, they were able to enjoy competing one last time and inspiring others to follow in their footsteps.